Japan is in the Northern Hemisphere, meaning that it has the same winter months as North America, Canada, and Europe. Therefore winter in Japan is from December to April. It snows a lot in Japan, but snow is never guaranteed at any time. Even the travel scientists & powder aficionados at SnowLocals can't predict exactly when and where it will snow. In a typical year, most ski resorts in Japan plan on opening in the last week or last few days of November. There is always the possibility of a great early-season storm and sometimes a ski area will open in mid-November. However, it is risky to plan your trip around a tentative early opening or possible autumn storm. Alternatively, there have been delayed openings in some years due to a lack of early-season snow as well. The major ski resorts in Japan have snow making capabilities, but the bottom line is if you want to ski the famous Japanese powder, then the very early season is a risky time to plan your trip. As December progresses, there is generally more reliable snow and by the holidays the mountains should be 100% open. If you are traveling with the family for the Christmas or New Years holiday break, then plan on busier ski areas as many others are doing the same. Book early for these holiday dates and be prepared to pay more as accommodations can dramatically increase their prices over New Years - the busiest time of their winter. In December, plan on daytime temperatures above freezing (mild by Japan's standards) and expect a few intense winter storms that come through and drop a wetter "base layer" of snow. In a nutshell: plan and book early if your only available travel time is over the holidays. In early December expect empty resorts, bargain prices and an unpredictable amount of fresh snow. Pretty much like December anywhere else at ski areas in the Northern Hemisphere. After the New Years crowd goes home, the powder crowd shows up. January is the month to ski/ride face-deep blower pow every day. It is the coldest month (meaning dry snow), the stormiest month, and the most reliable month for deep snow. Hence the nickname 'Japanuary.' You know now that the secret is out and other powder-lovers are planning Japan trips too. Therefore, these days you must also plan and book in advance for most January trips unless you are seeking a more undiscovered destination in Japan. If you are a beginner or a warm-weather skier/snowboarder, and you have flexible travel dates, then keep in mind that January will be cold, rarely sunny, and very snowy. This is the draw for most powder pilgrims, but these are difficult conditions to learn in and you will not progress to the level of face-shots and tree-skiing after just one lesson. January is the high season for accommodations and therefore prices will be higher than December or February (except Christmas & New years). In a nutshell: Wanna ski JaPOW? Come in Japanuary! There is no catchy nickname for February in Japan... yet (Feb-stillgreatsnow-uary?). But this is still a perfect month to ski/ride deep, light powder and without the crowds of the previous weeks. Be mindful of the Chinese New Year (generally late January or Early February) when planning a trip because this is the second very busy time for Japanese ski areas. Accommodations will sell out and will charge more over the Chinese New Year. Afterwards though, and for the rest of February, there are few international holidays and the powder is increasingly less tracked. Temperatures will begin to to increase slowly, still always below freezing and only slightly higher on average than January. The sun might peak between the clouds or shine for a day between storms more often, but you will still think you are in a snow-globe if you ski Japan in February. In fact, unless you were born in a snow-globe, the difference between January and February in Japan is negligible, both will deliver more snow that you imagined possible. 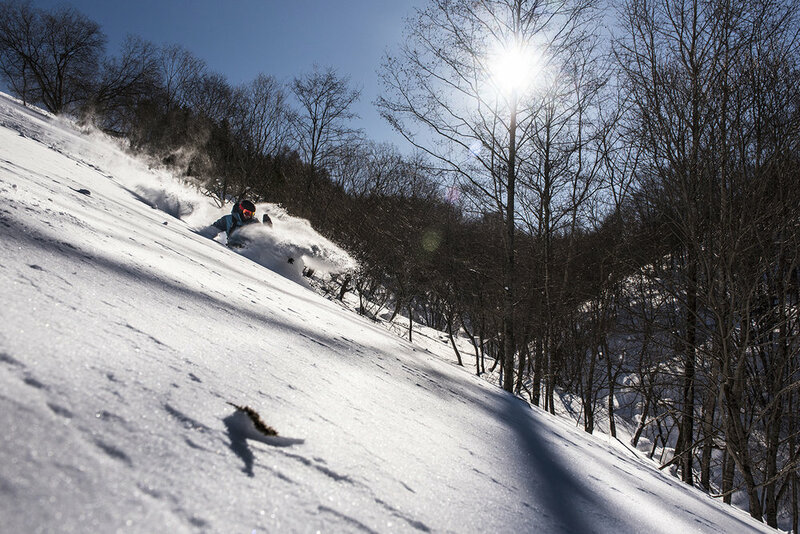 Japan is on the map now and booming in popularity for skiers and snowboarders. So, still book as early as possible for February trips if you don't want to be sleeping in a snow cave. In a nutshell: January gets all the credit, but the deepest days of my life have occurred in February. Don't listen to your neighbor the know-it-all, February is a great time to ski POW. March generally marks the beginning of the spring skiing season in Japan, and a reduction in the number of consecutive powder days. The first weeks of March can be unpredictable as winter either lingers longer than usual and keeps delivering fresh snow, or temperatures can warm up -- and quickly. The crowds will have dispersed by March because the powder is no longer guaranteed. However, early March is a great time because of the cheaper accommodation prices, surplus availability, and occasional big storms. Once mid March arrives, the sun is out more than the clouds for the first time since November, and you will have some beautiful blue-bird days with incredible views instead of incredible snow totals. If your travel dates are flexible and you are a beginner or intermediate on the slopes, then March might be your month to avoid the crowds, freezing temps, and endless snow. Similarly, if you are traveling with small children, start them out skiing/riding in sunny spring conditions so they are certain to have a good time and stick with it. A few sunny days and some après drinks overlooking the mountains and out to the ocean might be all it takes to get you hooked on the snow-sliding sports. Once your skills improve, then return for the deep stuff earlier in the winter. In a nutshell: March is sunnier and cheaper than the previous months. Give it a try if powder isn't your very top priority. Break out the Hawaiian shirts and put away your snorkel. April is full-on spring skiing with beautiful days, warming temperatures and season-ending parties. The monster snowpack that has accumulated over the wither will begin to melt as the days warm up, but there is typically enough snow to ski to the base of most mountains until the lifts stop in early April. April is also the time to work your legs on longer tours into the backcountry and higher into the alpine. Expect warm temps consistently above freezing, and burnt out seasonal ski instructors. The ski areas will be closing down for the season at different times from mid April until early May. There is not really a system that dictates which ski area closes when, so check when the place you want to visit typically closes (extended season are possible in large snow years). In a nutshell: Longer sunny days, bargain accommodation prices, and still the same renown Japanese hospitality. Learn to ski in April, or get deep into the backcountry in April. In any case, it's not JaPOW, but it won't disappoint as a vacation.